One membership, endless possibilities. 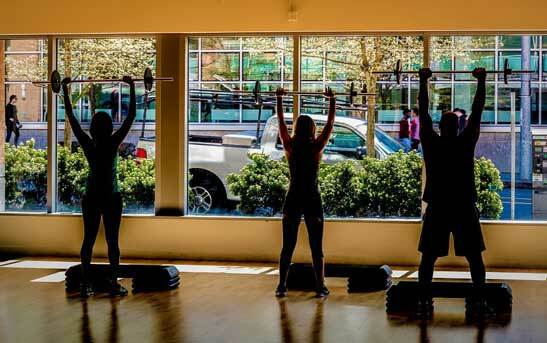 The best classes, training and gym all at two of Seattle’s best facilities. Plus get fully stocked locker rooms and free parking. A balanced approach to fitness. We offer various programs that develop strength, endurance, mobility, flexibility and recovery. Take a holistic approach to fitness and change the way you live forever. You are different. So are we. Our comprehensive offering allows you to create a customized fitness routine that will both motivate and help you crush your goals. Flow Fitness was borne out of frustration over ﬁtness options. People had to choose between a cheap, sweaty gym environment or expensive fitness boutique that does only one thing. Some are simply forced to get memberships at multiple places to meet their needs. We decided there has to be a better solution. We created Flow Fitness- a place that offers great value, a variety of quality workout programs, with an awesome staff, clean facility and an energized community people love. People come to Flow because we’re different. They stay because we make a difference. Our people make us great. They’ll do the same for you. Located in the heart of Fremont, our new 13,000 sf facility is the first multi-studio boutique gym in Seattle. With dedicated space for yoga, barre, cycle and team training, you’ll get the quality and variety to stay motivated. Our state of the art strength and conditioning gym is always available for individual workouts or for personal or semi-personal training. Measure your progress in a new dimension. With our Fit3D 360 degree body scan, you’ll get the data to create fitness goals that will lead to more productive, long term results. Ditch the scale and see how a Fit3D scan will change the way you view your body.